Hello and welcome to day 8 of the Make & Craft Blog Tour! I’m delighted to take up the baton today in this exciting magazine launch blog tour, to tell you a bit more about the magazine and give away a lovely book too! For those of you visiting my blog for the first time today – a big hello! I am Amy, mum to two lovely girls aged 8 (Happy Birthday for today Grace!) and 4, and I am a serial crafter. I have tried many, many crafts in the past and my current favourites are sewing, knitting, crochet and cake decorating. We also like to make lots of things at the home with the children and you’ll usually find some sort of messy project taking over the dining room table! The project that I think I enjoyed the most and was incredibly pleased with was the crochet blanket that I made for my niece when she was a baby. 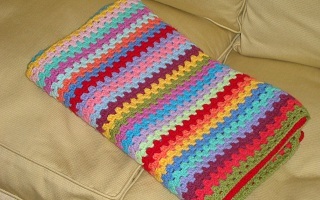 I followed that instructions from Attic24 and I adore the colourful granny stripe pattern. It was one of my first crochet projects and I can’t wait to make another one. Anyway, enough about me and a bit more about the magazine! Make & Craft is a new magazine that is launching on 12th October – not long now! They already have their lovely website live so you can go and have a browse and while you’re there, check out the fab subscription offers – including 3 digital copies of the magazine for just £1! The magazine is packed full of craft projects and there is a great craft community on the website, which includes Craft Swaps, Craft Book Club, Craft Challenges and much more. The lovely folks at Make & Craft magazine sent me a book to review as part of their launch and have offered one for me to give away to one lucky reader too. 30-minute knits (ISBN 9781844488773) by Carol Meldrum and published by Search Press, is a lovely little book full of quick and easy knitting projects which, as the title suggests, shouldn’t take you long to whip up. Designed to knit up quickly, these quick-fix designs will liven up a boring TV show or give you something to do while dinner’s cooking. Boring train journeys will never be the same again. Best of all, you won’t need to spend lots of money on new and fancy yarns (unless you want to) as they can easily be knitted from what you have in your stash of leftovers already. There are lots of projects I can’t wait to get into and will be perfect for all the time I spend sitting in the car waiting for the children to come out of school. First on my list is the cute little string of birds, followed closely by the bow hairclips, which will make brilliant little Christmas gifts for the girls. If you’d like to win a copy of this delightful little book then all you need to do is register as a member on Make & Craft then leave me a comment to say you have done so and to tell me what craft project you are working on at the moment. You have until 5pm on Friday 12th October to enter, then a winner will be drawn at random and contacted within 2 days. One entry per person and UK entries only please. If you aren’t the lucky winner you can order this book with free P&P by calling Search Press on 01892 510850 and quoting ‘Make & Craft Blog Tour’. Do check out the Make & Craft blog to see who else is taking part in the blog tour and tomorrow you should definitely head over to Crafty Painter who will have another lovely book to give away. Good luck! Have registered – I need that book! I’m a lapsed knitter (I say “lapsed”, I actually mean I never properly got started) and am determined to get back into it again. It WILL happen this time! I have registered! I’m knitting a patchwork blanket for my daughter, but the one for my son took five years, so hope this doesn’t take as long. 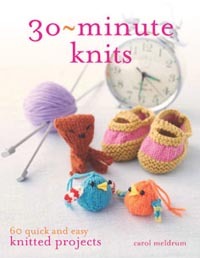 Would love a copy of 30 min knits – sounds ideal – I’m too easily distracted! I have registered. I am madly trying to finish off my projects for my turn on the tour on Friday!! I love having new ideas, particularly if they are quick as they are so much more satisfying! Hi! Have just registered! I’m doing a sewing course at the moment and my current project is a dress for my daughter ( challenging my beginner skills!!). But I am hoping to learn how to knit soon so this book woud be perfect! Hello Amy! Don’t enter me i this one as I cant knit very well hee would be unfair, just wanted to drop by and say hello and say that the blanket is stunning. Hello Amy, Great to have you taking part in the Make and Craft book club blog tour. I love your crochet blanket and all the colours. This books looks perfect when you have snippets of time to fill with a bit of knitting that results in something being finished in quick time. Hi Katharine! Thanks for stopping by and for letting me take part in the blog tour. I am about to cast on a little birdy so I shall report back how it goes! I am already registered, and I am currently knitting a pair of Jubilee socks ( I had one finished in time – then got sidetracked!) and cross-stitching some Christmas gifts. Little projects are always great to slot in for a break from larger makes. I signed up on the first day of the blog hop. I am eagerly awaiting it’s launch. Currently, I am in the middle of trying my hand at quilling a pair of earrings. I would love to win this book as I am only a beginner knitter. I’m all registered on the Make & Craft website. At the moment I am working on a super secret festive event – which has involved a lot of hand sewing. I’m also knitting something for my post next Monday on the blog tour! 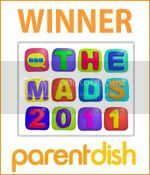 Lovely blog and website Amy. Hope Grace had a lovely birthday. She shares her birthday 3rd October with me though I was slightly older being 66 yesterday! All this building up to the Make and Craft launch is very exciting and your give away book looks lovely and this is another crafting must that I’d love to win. So lovely to find more blogs through this tour! I can’t wait to publish my post next week! The book would be fabulous as I’m a bit of an impatient crafter! I’m currently crocheting granny squares! I’ve registered at the M&C website! Registered and ready to go on the Make and Craft website. Can’t wait for the magazine to come out! I NEED that book! My knitting always takes forever as I have the attention span of a gnat! Needless to say I have a knitting project on the go as well as stocking up my website with Christmas stock.